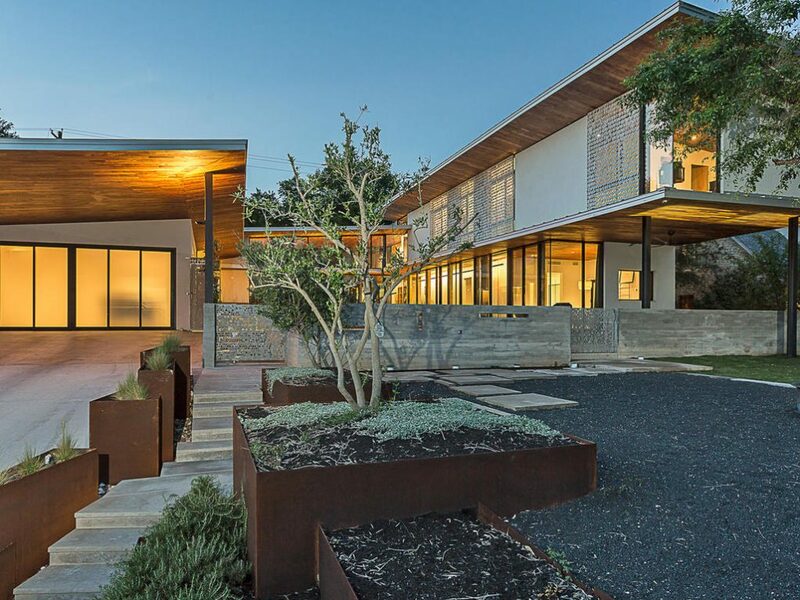 In Austin’s Rollingwood neighborhood, this Texas treasure is an architectural marvel designed to capture light and shadow uniquely. 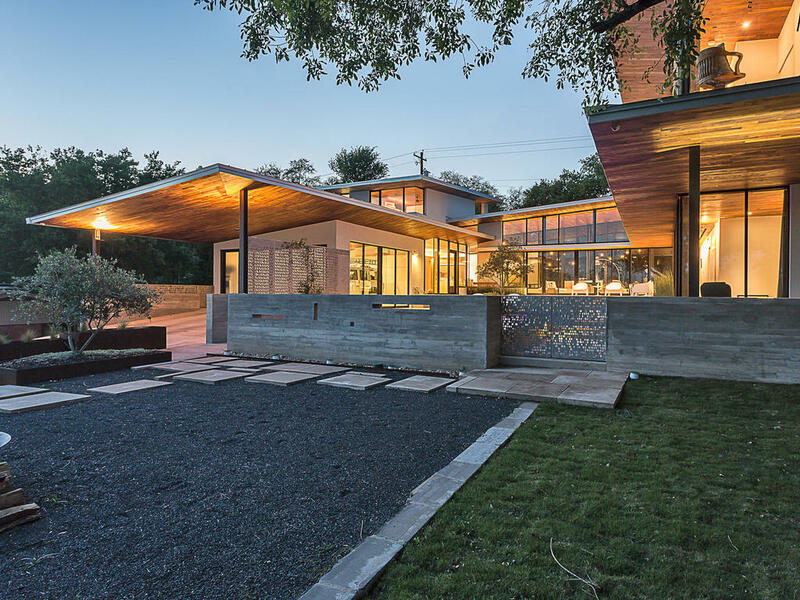 The home is situated on a limestone bluff eight feet above a suburban neighborhood street, creating a private environment with a richly planted landscape and views of downtown Austin. The house stands between live oaks at the rear of the site and an ash tree in the front yard and is organized around a central courtyard and pool, providing an outdoor gathering space for the family. The U-shaped plan floods the pool court with the southern sun. 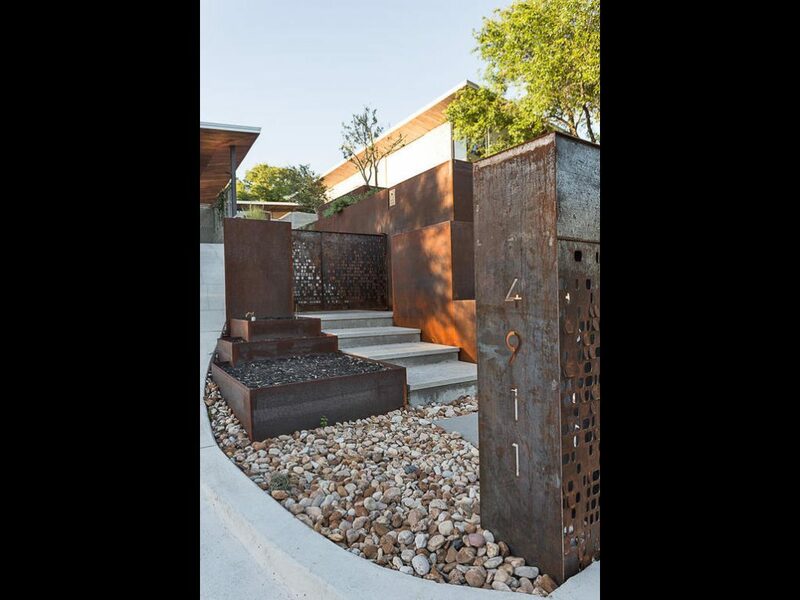 The home was designed by BSC Architecture to be in conversation with the outside world. Large roof planes extend beyond the house, casting shadows and protecting southern and western-facing exposures from direct sun in the summer. Sun-tracking computer modeling was used to calibrate the roof planes to protect the interiors from the direct sun from April through October and provide passive solar heating in the cooler months. Outdoor spaces connect to the interiors through shaded glass walls, and ovable shutters provide sun control, letting dappled light through to animate the interiors. The shutters are formed from water-jet cut aluminum panels inspired by moon phase charts. The perforations are bent at random angles to form a light reflecting louver for each opening. The shadows cast are meant to heighten one’s sense of the movement of the sun and the passing of the day. The perforated panel design is also used for a carport screen, courtyard gates, entry gate, and custom exterior light fixtures. The use of the perforated panels outdoors creates conditions of dappled light, on paving and wall surfaces similar to those of the interior. Natural materials used throughout the house: warm red-brown mesquite, ground concrete floors, sanded aluminum, board-form concrete, and weathering steel all contribute to a palette that speaks of the desert climate and the patina of time. This home is listed for $3.95 million with Moreland Properties and is showcased by Luxury Portfolio.